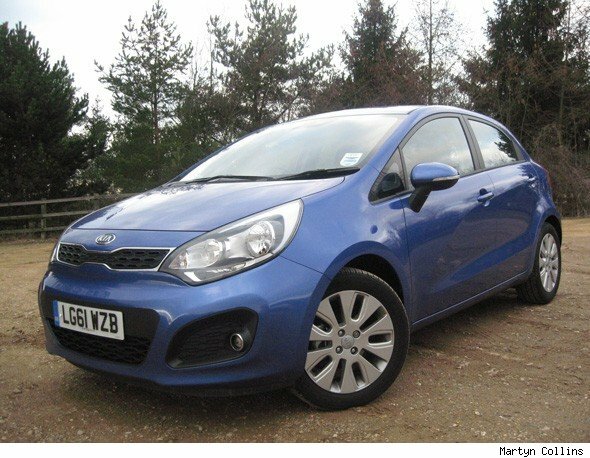 Thanks to Alex's recent road test and my first drive at the launch last year, we already know that the latest Kia Rio is a stark contrast to its predecessor, being a genuinely interesting, high-value alternative to a Ford Fiesta. However, we've only driven the rather lacklustre 1.4 petrol, so we were keen to see what the 1.1-litre three-cylinder diesel was like. This is the most impressive engine in the Rio range, as it boasts 85g/km emissions, which according to Kia, are the lowest of any non-electric vehicle on sale in the world. Sadly, this figure is only for the basic non-air conditioned 1 version, but to see what it is like to live with the ultra green Kia, we spent a week with the 99g/km £13,195 Rio 1.1 CRDi Ecodynamics 2 model to find out. Thankfully, despite the new green engine, the looks are unchanged from standard, which is a good thing as it is possibly Chief Design Officer Peter Schreyer's best work yet. At the front, there's the same Kia family nose, which is neatly integrated with the large and distinctive headlight units. The Kia badge sits above the grille, with a bold bumper and spoiler below. Look closer and you'll spot the closed-off grille that is unique to the Ecodynamics model. From the side, you can't miss the forward-leaning wedged profile and the coupe-like roofline. Other modern design touches include the sculpted wing mirrors with built-in side repeaters, the distinctive undercut on the doors and the short rear overhang. 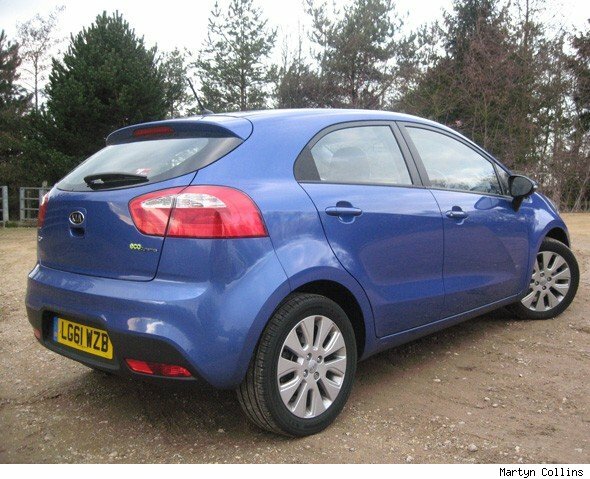 At the back of the Rio, the design is as curvy as the front with the coupe-like rear window and sportier Ecodynamics roof spoiler. Another key part of the rear styling are the large, sleek light clusters which are mounted high up the rear of the car and stretch across the tailgate. 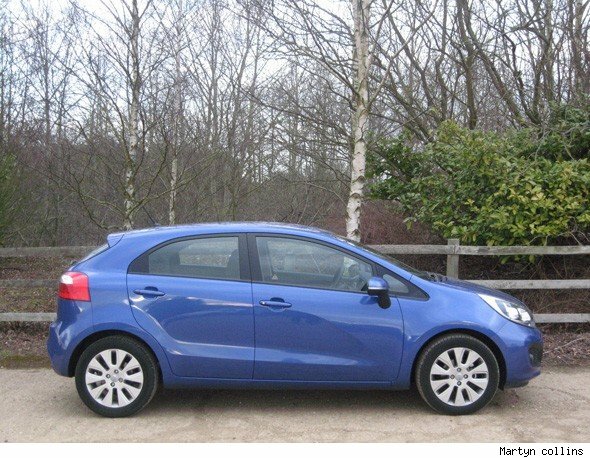 Our test car was fitted with one of two diesel engines available for the Rio, in 1.1 and 1.4-litre capacities. However, it is the new 73bhp 1.1-litre fitted to this car that will grab headlines. A three-cylinder unit, it is fitted with a variable vane turbo and this, combined with the long-geared six-speed manual transmission, ISG stop-start system and other Ecodynamics features combine to produce a spectacular claimed Combined fuel consumption of 74.3mpg. This means you don't have to pay for road tax for the first year and the Rio should be cheap to run. The Rio lacks the dynamic polish of European rivals. The steering could do with more feel and the handling, although tidy, doesn't feel particularly engaging. Still, there's plenty of grip and surprisingly little road noise. 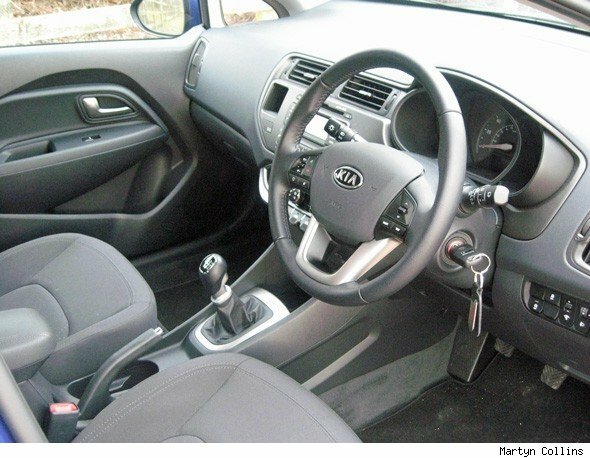 Inside, the Kia feels much bigger than its supermini dimensions. This is mainly down to the modern, attractive cabin. In 2 specification it doesn't feel basic either, but build quality isn't quite up to European rivals. At idle, it is obvious from the vibrations this is a three-cylinder engine, but at speed it is much smoother and surprisingly refined. Long gearing means acceleration is relaxed and you will have to work it hard to get up to motorway speeds, thus hurting the Ecodynamic green credentials. There is an impressive amount of torque from low down the rev range (125lb/ft), but to get the best out of the engine means stirring the light six speed manual transmission. Change quality could be better, but it proved to be a good combination with this engine. This Rio is no racer in the performance department as you might have guessed, but then again this really is not the point of this car. Acceleration to 60mph comes up in a very leisurely 15.5 seconds and the top speed is 106mph. Thankfully, it doesn't feel as slow as the figures suggest on the road. We completed a 250-mile motorway trip while we had this car and despite cruising at 80mph it slurped just half its tank of diesel. So, what are the biggest disappointments in what is otherwise a very endearing package? For us, it is the ride and steering. The Rio's steering is light which is fine around town, but head out of the city and the lack of feel and precision annoys. Still, visibility is generally good and parking is a generally a doddle. Fine on the motorway, around town the Rio's firm ride was upset by pockmarked streets. Thumping over even the most minor of imperfections, part of the blame must be put at the bigger 16-inch alloys and tyres that are standard on 2 models. Rear space in the Rio is average; I'm over six foot and there was enough head and legroom despite the sloping roof line to get comfortable. A 288-litre boot is also a surprise considering the curvy shape; fold the rear seats forward and this increases to 923 litres. In 2 specification, the Rio has more kit than most will ever need. Included is air-conditioning, Bluetooth, wheel-mounted audio controls, a four-speaker single-CD stereo and an aux-in socket for iPods, as standard. The standard-fit, CD player sounds good enough with four speakers and the Bluetooth system was easy to pair with my phone. A navigation system is not available for the Rio. So should you buy the greenest Rio? Well, in Ecodynamics form we think it makes a compelling package. It looks great with a spacious interior, but is exceptionally frugal without too many compromises and even has the security of a seven year warranty.